Many weeks ago on my Instagram account I posted a photo of the new buffet that we received for Christmas from my parents that matches our dining room table. I hadn't blogged about it yet because quite frankly I was unsure of what I wanted to do with the space above the buffet and I hadn't done anything else with the dining area as well. 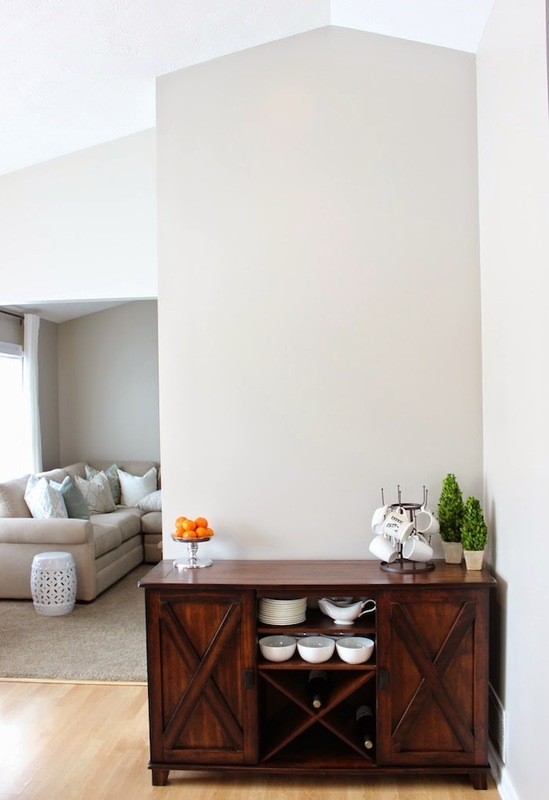 I've finally decided on what I want to do with the space so I thought I would finally share with you my plans, the piece of furniture, the space where it sits, and other shelving ideas for above buffet areas as well. So with that here is the buffet that currently sits in our kitchen. Isn't she pretty? 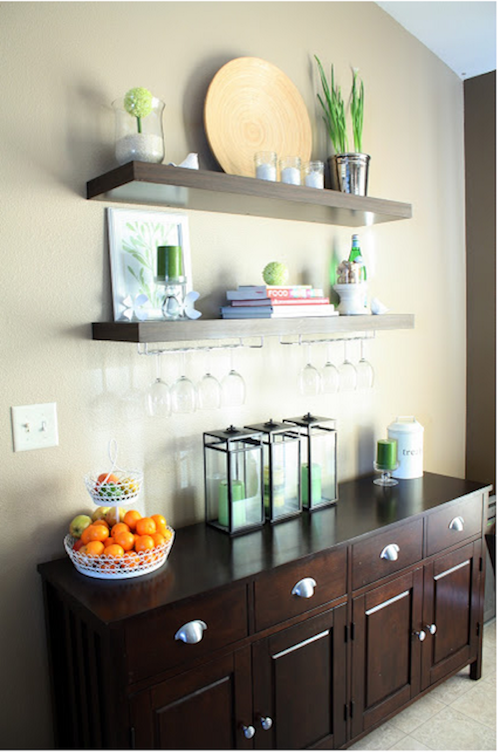 It's the Verona Buffet from World market and I love the dark walnut stain and "x" wood doors. 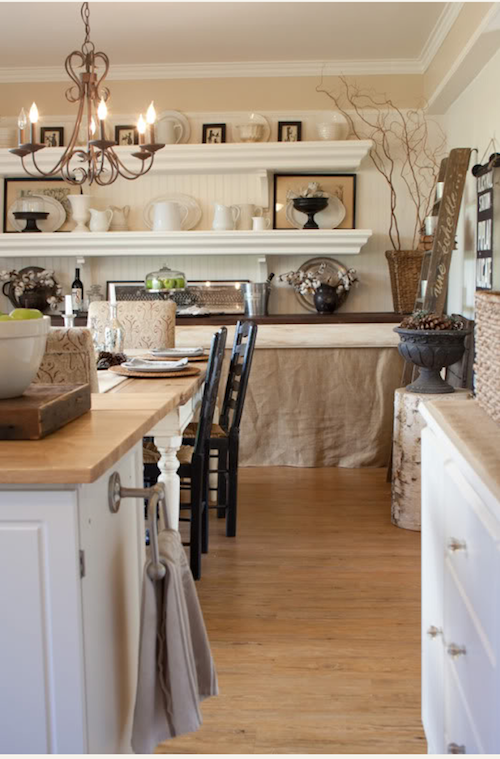 It adds that farmhouse look that I love! So far, I haven't decorated the space but I have already been using it for storage. 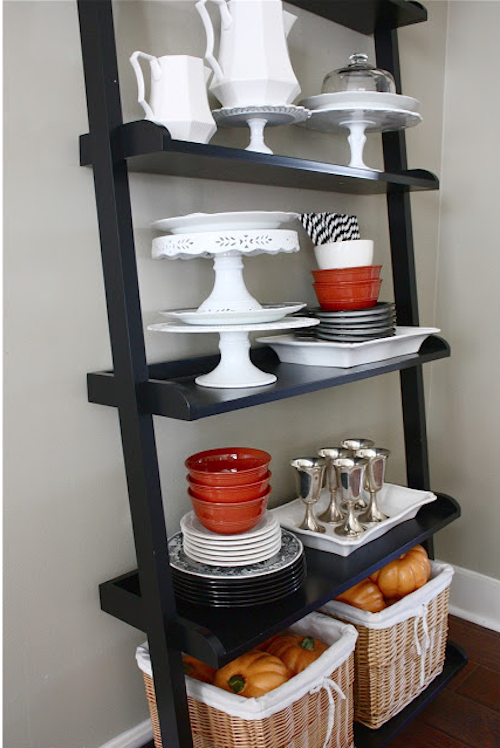 I have been using it to store my china, chargers (also from World Market: I love that store! ), my cookbooks, and wine! Our kitchen has cathedral ceilings, which means there is a lot of wall space above the buffet to work with. I originally thought about just putting a round mirror above it and calling it good, but I ultimately decided that I wanted more storage space. 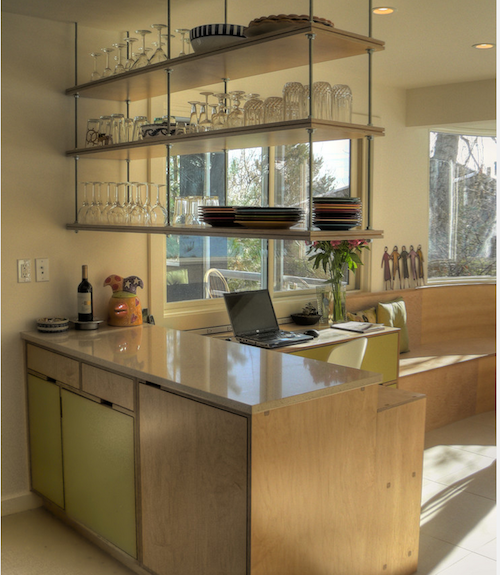 That said, I plan on adding floating shelves to this space (courtesy design plans of Shanty to Chic). 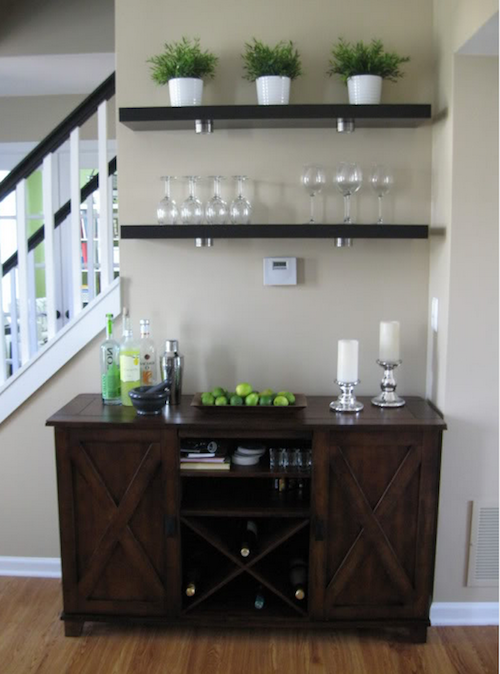 I am then planing on also installing stemware holders underneath the bottom shelf so that I can free up one of our kitchen cupboards that is currently dedicated to all my glassware. I'm not the only one who loves glassware, right? Also, since taking the pictures at the way top, I've also added this coffee mug rack from World Market. Proof that things are always changing around here and that I have a slight obsession with World Market! Below I have listed out some shelving ideas that I have used for my own inspiration for this project, along with some that I thought could be inspiring to others. 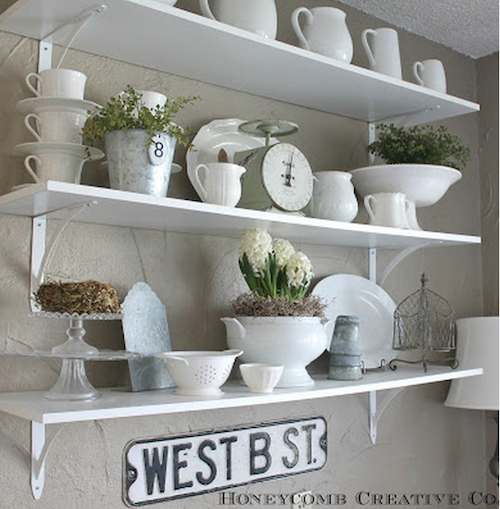 Although I have decided on floating shelves, I still like getting ideas on how to decorate or make use of them. 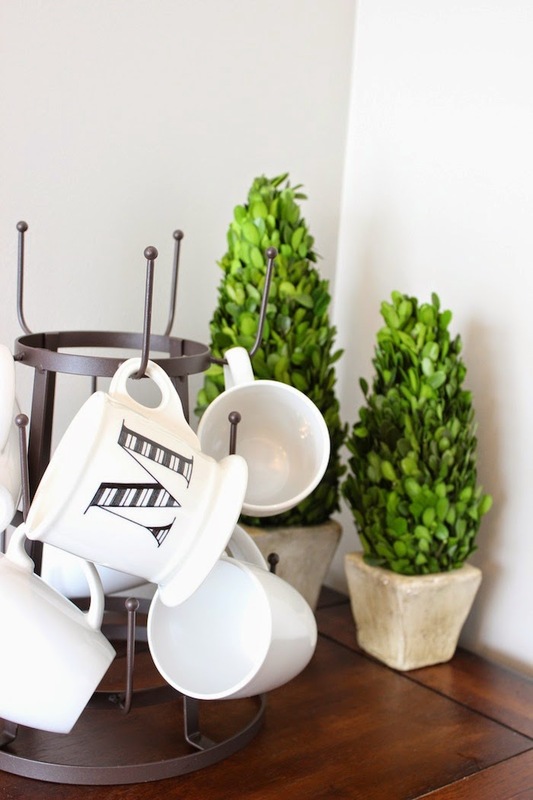 I love the idea of using them to store kitchen type items or serving ware pieces, but I also plan on incorporating some greenery like many of the photos have as well. 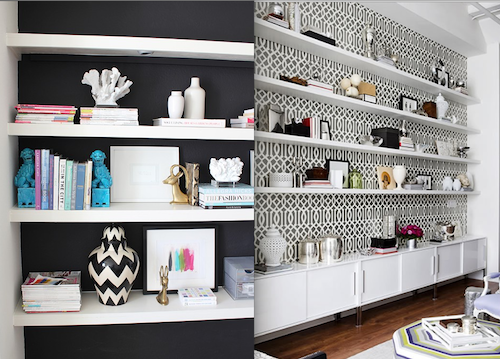 I love the chalkboard painted wall behind the shelves. Such a fun idea! This is my exact buffet that I own, so of course this served as some inspiration. I love how they tied the accent color green throughout the various items displayed. Doesn't this just look cozy? 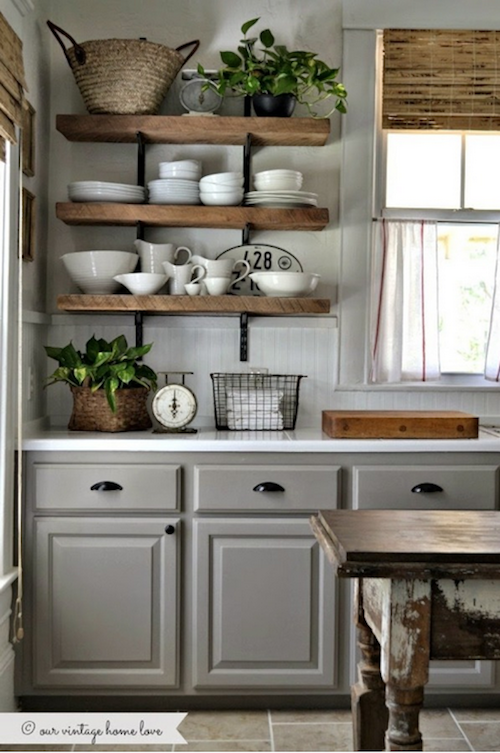 The crown molding type shelf gives this room so much charm. You can never and I mean NEVER go wrong with white serving pieces, greenery, and galvanized objects. 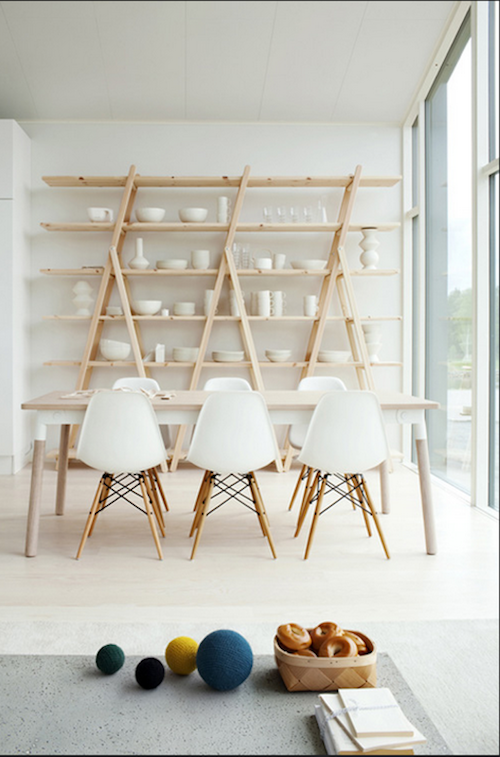 Having all of the objects on the shelves white really helps to highlight the geometrical shapes that the shelves create. This too seems really cozy to me. 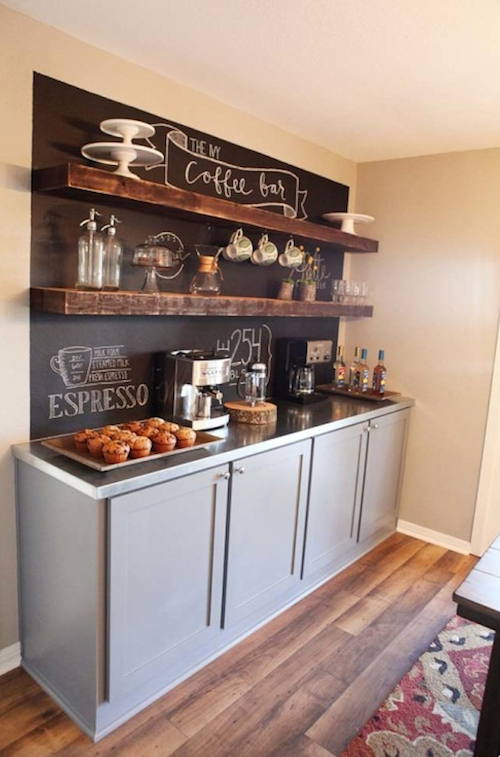 Although it's over a kitchen counter, you could easily implement something similar over a buffet. These are the kind of stemware holders that I would like to add under the bottom shelf as well. Adding a contrast color paint or wall paper behind shelves could also create a beautiful look! So what do you think? 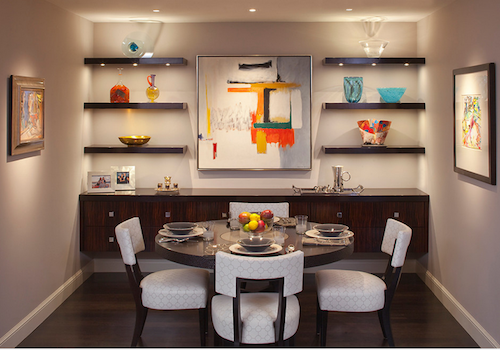 Do you like shelving over buffets or open shelving in general? I'm hoping that I can tackle this project very soon. The only thing that is keeping me from starting this is the DIY mirror that I've been working on for wayyy too long (Let's just say that I had a little incident with the spray paint and it got everywhere:)). Once that is complete though, I will get to building! Love these ideas, Megan. Also, I seriously can't wait to see your mirror!